After several months of uncertainty, Monsanto BioAg will continue to offer Met 52 bioinsecticide. However, as new sources of inputs are being pursued, the product will not be available between February and October 2016. This affects both the EC and Granular formulations. Met52 comes as a granular (pictured) or emulsifiable concentrate (EC) formula. Both will be temporarily unavailable in Canada from Feb to Oct 2016. Met 52 (which contains the beneficial fungus Metarhizium anisopliae) is one of three fungal-based bio-insecticides we have registered in Canada for greenhouse pests such as thrips and whitefly. During this gap period, growers using Met 52 in their IPM programs may want to switch to products containing the fungus Beauveria bassiana (e.g. BotaniGard 22WP, BioCeres WP). Beauveria also has activity against thrips and whitefly. For more details on best use of Beauveria-based products, see this page on the GreehouseIPM.org website. New tool in floriculture IPM: testing your microbial products. What’s the first thing you do with your shipments of predatory mites, parasitoids and predators when you receive them? You probably check to see if these natural enemies are alive before you put them out in the crop. Now Albert Grimm (Jeffries Greenhouses) and I have come up with a way to check if many of your microbial products are still viable, too. We’re still in the process of testing these methods for all microbial products, so please consider this preliminary. Right now, we know this works for Beauveria and Metarhizium-based products only (e.g. BotaniGard, BioCeres and Met52). I’m hoping to put the methods up for more products in December. 3M™ Petrifilm™ Yeast and Mold Count Plates. These are pre-loaded with media that grow a variety of fungi (Fig. 1). They are about the size of one playing card, are relatively affordable ($113.97/50), and are easily stored (click here for more handling details). 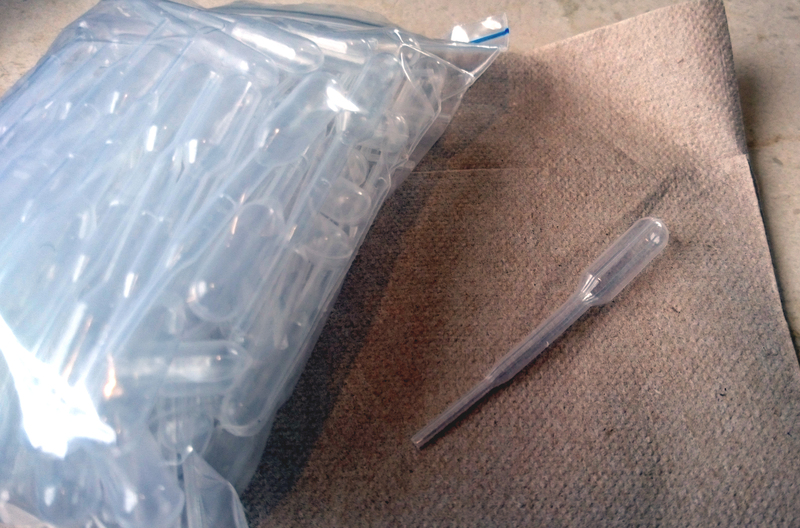 Disposable plastic pipettes (Fig. 2). I bought 0.2ml ones from Amazon.ca ($4.16 for 100). Distilled (sterile) water. Unopened bottled water will do in a pinch. Do NOT use tap water. Figure 2. 0.2mL sterile, disposable pipettes that can be obtained from Amazon.ca. Step 1: Disinfect the water cup and the measuring spoon with rubbing alcohol. Wipe dry with paper towels. Step 2: In one plastic cup, add a small amount of sterile water (a few mL is fine). Keep for Step 4 to act as a control. Step 3. Take a second cup to mix up your product in. Add 200 mL of sterile water. Then add approx. 1/16th of a teaspoon (0.3ml) of product (Beauveria or Metarhizium). To measure, fill the smallest baking measuring spoon (1/8th of a teaspoon) about half way. Stir well. This will give an approximate concentration of 1 g/L, which is similar to recommended rates of these products. Step 4: Take a disposable pipette and fill with sterile water. (Make sure to re-seal your bag of pipettes so they stay clean and sterile). Grab a single Petrifilm and peel back the thin, clear cover on top. Carefully squeeze the pipette to form a line of water across the surface of the Petri film. Step 5. Repeat Step 4 on the same Petrifilm using your product in solution. You can use the same disposable pipette (since it only had sterile water in it previously). Figure 3. Photo courtesy of Albert Grimm. 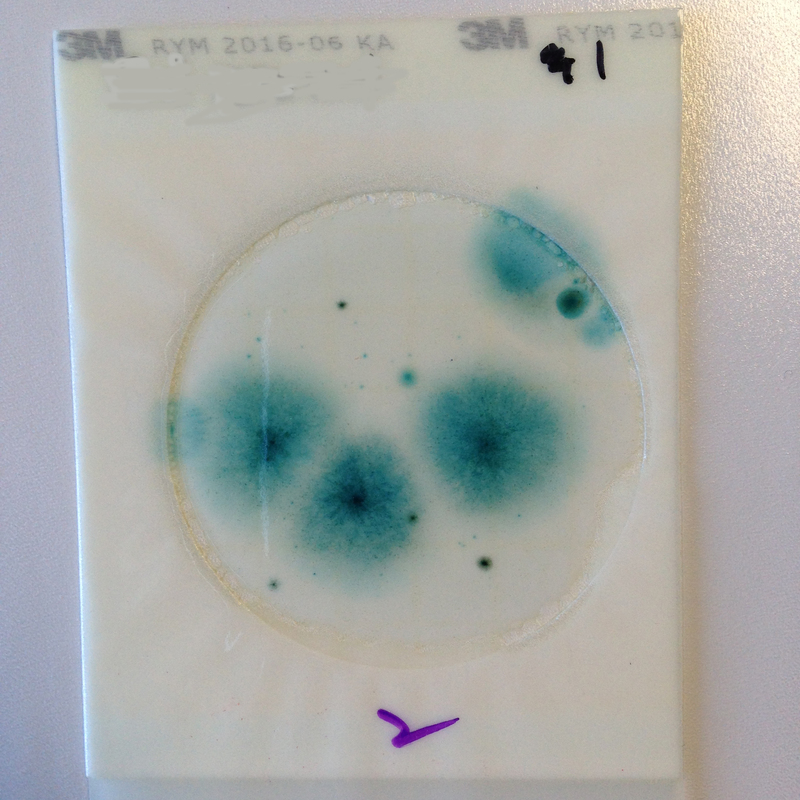 A 3M Petrifilm used to test the viability of Met52 and BotaniGard. The blank water control indicates that all fungi came from the products, not from the water source (here, distilled water). Step 6. Gently drop the plastic cover back over the Petrifilm. Write directly on the plastic cover with a sharpie to indicate the position of your “control” water line and your “product” water line (see Fig 3). Store the film between 20-25 °C in a dark location. Step 7: After a minimum of 16 h (the time it takes for Beauveria spores to germinate), check your Petrifilm. The sterile water line should be blank. 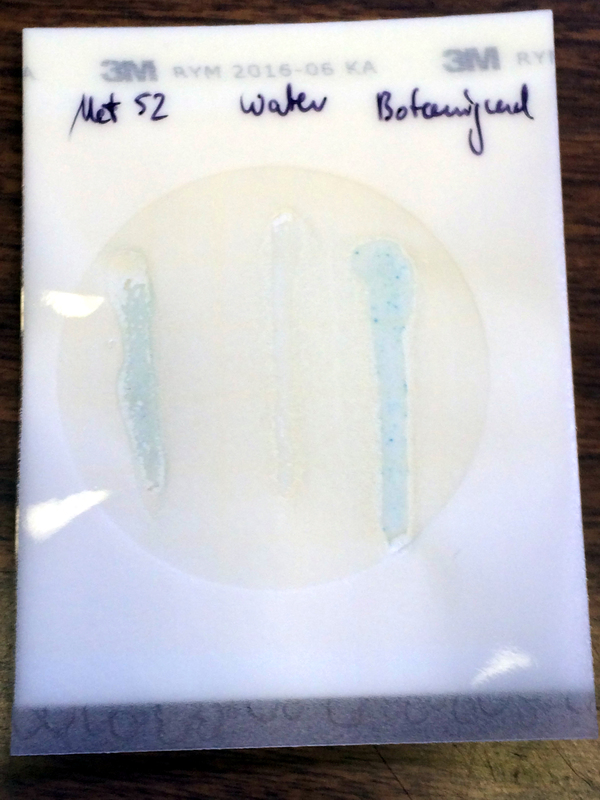 The Beauveria and Metarhizium lines should be light blue -the film has a dye in it that reacts to fungi (Fig. 3). Note that this dye reacts to ANY fungi or yeast. Thus, you CANNOT use it to diagnose what fungus is growing. This is why the sterile water control is so important – you want to be sure the reaction is from your microbial product, and not from random fungal spores in your water. With the growers still tentative in their use of microbial-based products, this viability test may give growers some piece of mind. It will be particularly useful for product that’s been shipped in hot summer months, or in the dead of winter, as some products are sensitive to extreme temperatures. It can also be used to test product that has been sitting in storage for long periods. Note that this is a simple live/dead test. These methods do not quantify how much of the product is still viable. That’s something Dr. Anissa Poleatewich (Vineland) and I are working on, as we think it would be useful to know if your product is decreasing in efficacy over time. So, stay tuned for more information as we perfect our methods.